today i am feeling a bit discouraged. i am tired, not having a lot of perspective, and reading the sermon on the mount again trying to gain some. interesting that matthew 5-7 get read often when i am feeling down and discouraged about something in life. 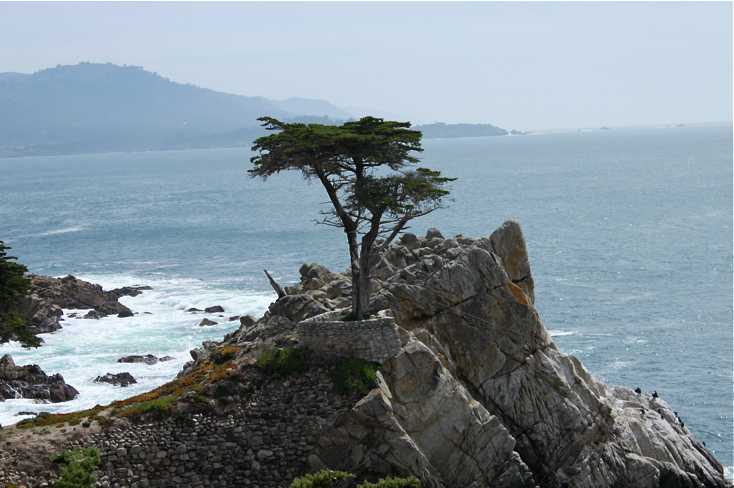 this lone cypress tree is sure beautiful. i was amazed at its apparent serenity all alone in the midst of rocks and right on the edge of what could be wild crashing waves in the midst of a storm. it is a wonder and a beauty. i can't help but be reminded of where Jesus taught His disciples in matthew 7 that a wise man builds his house (or in this case tree) upon the rock. when the storms came and the waves crashed, the house would not be shaken. only a foolish man would build upon the sand because the same storms come to everyone. his house would surely fall. great would be its fall. then i think of psalms 1. david said that the righteous man was like a tree planted by streams of water. he bore fruit in his season and his leaf did not wither. whatever he did prospered. gosh, it sure looks lonely to me out there alone on the rock. it is so close to the winds and the waves and i am sure the storms are felt intensely. but i want to be a tree planted by the waters. i want to build my house on the rock so that when these times of discouragement and doubt come, my foundation is firm. God sent me the perfect thing to read today at just the right timing. i follow randy bohlender, a blogger and intercessory missionary out in kansas city at ihop. i think his blogs are insightful and funny. i love how he and his wife have 4 kids of their own and 3 they have adopted. i really love that he is willing to be vulnerable and because of that his own struggle and journey spoke to my heart today and gave me hope.